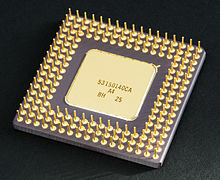 The computer industry has used the term central processing unit at least since the early 1960s. The form and implementation of CPUs have changed over the course of their history, most modern CPUs are microprocessors, meaning they are contained on a single integrated circuit chip. 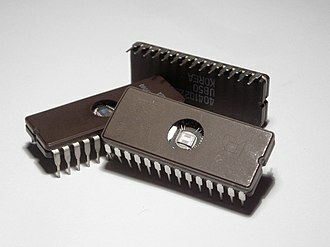 An IC that contains a CPU may contain memory, peripheral interfaces, some computers employ a multi-core processor, which is a single chip containing two or more CPUs called cores, in that context, one can speak of such single chips as sockets. Array processors or vector processors have multiple processors that operate in parallel, there exists the concept of virtual CPUs which are an abstraction of dynamical aggregated computational resources. Early computers such as the ENIAC had to be rewired to perform different tasks. 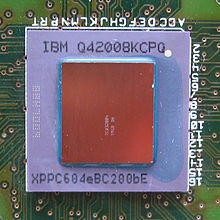 Since the term CPU is generally defined as a device for software execution, the idea of a stored-program computer was already present in the design of J. Presper Eckert and John William Mauchlys ENIAC, but was initially omitted so that it could be finished sooner. 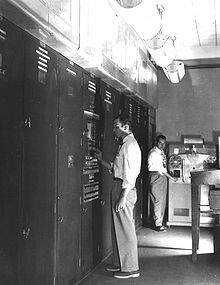 On June 30,1945, before ENIAC was made, mathematician John von Neumann distributed the paper entitled First Draft of a Report on the EDVAC and it was the outline of a stored-program computer that would eventually be completed in August 1949. EDVAC was designed to perform a number of instructions of various types. Significantly, the programs written for EDVAC were to be stored in high-speed computer memory rather than specified by the wiring of the computer. This overcame a severe limitation of ENIAC, which was the considerable time, with von Neumanns design, the program that EDVAC ran could be changed simply by changing the contents of the memory. 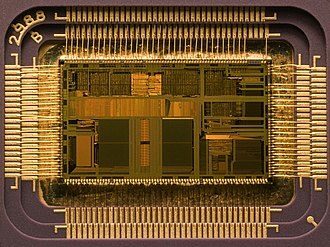 Early CPUs were custom designs used as part of a larger, this method of designing custom CPUs for a particular application has largely given way to the development of multi-purpose processors produced in large quantities. This standardization began in the era of discrete transistor mainframes and minicomputers and has accelerated with the popularization of the integrated circuit. 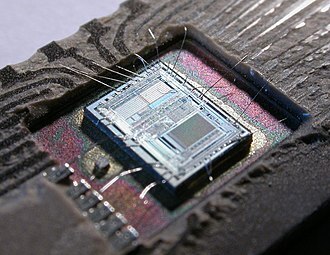 The IC has allowed increasingly complex CPUs to be designed and manufactured to tolerances on the order of nanometers, both the miniaturization and standardization of CPUs have increased the presence of digital devices in modern life far beyond the limited application of dedicated computing machines. 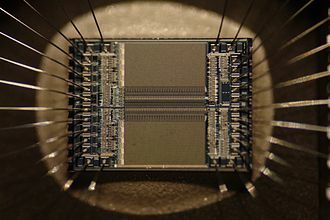 Modern microprocessors appear in electronic devices ranging from automobiles to cellphones, the so-called Harvard architecture of the Harvard Mark I, which was completed before EDVAC, utilized a stored-program design using punched paper tape rather than electronic memory. 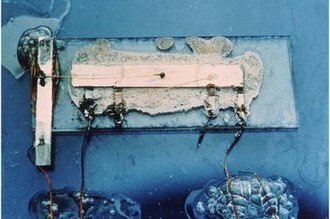 Relays and vacuum tubes were used as switching elements, a useful computer requires thousands or tens of thousands of switching devices. 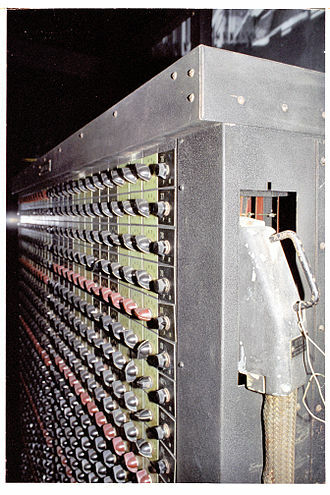 The overall speed of a system is dependent on the speed of the switches, tube computers like EDVAC tended to average eight hours between failures, whereas relay computers like the Harvard Mark I failed very rarely. In the end, tube-based CPUs became dominant because the significant speed advantages afforded generally outweighed the reliability problems, most of these early synchronous CPUs ran at low clock rates compared to modern microelectronic designs. 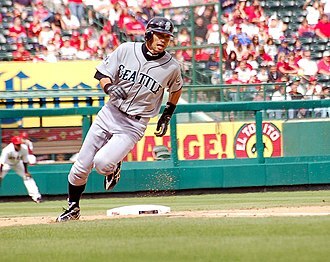 A relay is an electrically operated switch. Many relays use an electromagnet to operate a switch, but other operating principles are used. Relays are used where it is necessary to control a circuit by a separate low-power signal, the first relays were used in long distance telegraph circuits as amplifiers, they repeated the signal coming in from one circuit and re-transmitted it on another circuit. 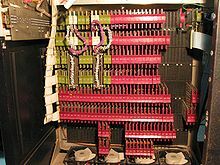 Relays were used extensively in telephone exchanges and early computers to perform logical operations, a type of relay that can handle the high power required to directly control an electric motor or other loads is called a contactor. 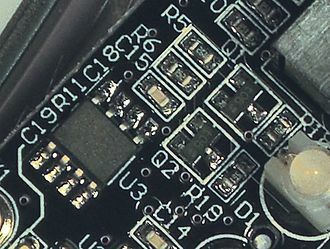 Solid-state relays control power circuits with no moving parts, instead using a device to perform switching. Magnetic latching relays require one pulse of power to move their contacts in one direction. Repeated pulses from the same input have no effect, magnetic latching relays are useful in applications where interrupted power should not be able to transition the contacts. 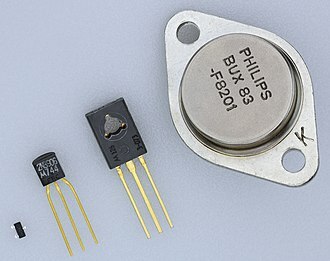 Magnetic latching relays can have single or dual coils. On a single device, the relay will operate in one direction when power is applied with one polarity. On a dual coil device, when polarized voltage is applied to the coil the contacts will transition. 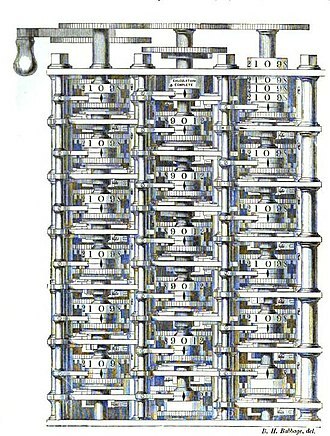 AC controlled magnetic latch relays have single coils that employ steering diodes to differentiate between operate and reset commands, american scientist Joseph Henry is often claimed to have invented a relay in 1835 in order to improve his version of the electrical telegraph, developed earlier in 1831. 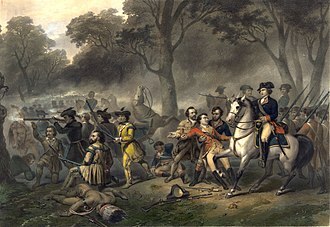 However, there is little in the way of documentation to suggest he had made the discovery prior to 1837. It is claimed that English inventor Edward Davy certainly invented the electric relay in his electric telegraph c.1835, a simple device, which is now called a relay, was included in the original 1840 telegraph patent of Samuel Morse. The mechanism described acted as an amplifier, repeating the telegraph signal. 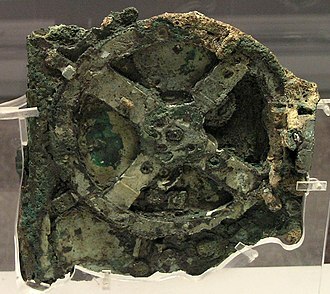 This overcame the problem of limited range of earlier telegraphy schemes, the word relay appears in the context of electromagnetic operations from 1860. An arithmetic logic unit is a combinational digital electronic circuit that performs arithmetic and bitwise operations on integer binary numbers. This is in contrast to a floating-point unit, which operates on floating point numbers, an ALU is a fundamental building block of many types of computing circuits, including the central processing unit of computers, FPUs, and graphics processing units. A single CPU, FPU or GPU may contain multiple ALUs, in many designs, the ALU exchanges additional information with a status register, which relates to the result of the current or previous operations. An ALU has a variety of input and output nets, which are the electrical conductors used to digital signals between the ALU and external circuitry. When an ALU is operating, external circuits apply signals to the ALU inputs and, in response, a basic ALU has three parallel data buses consisting of two input operands and a result output. Each data bus is a group of signals that conveys one binary integer number, the A, B and Y bus widths are identical and match the native word size of the external circuitry. The opcode size is related to the number of different operations the ALU can perform, for example, a four-bit opcode can specify up to sixteen different ALU operations. 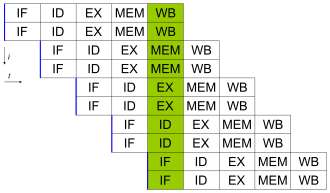 Generally, an ALU opcode is not the same as a machine language opcode, the status outputs are various individual signals that convey supplemental information about the result of an ALU operation. These outputs are usually stored in registers so they can be used in future ALU operations or for controlling conditional branching. The collection of bit registers that store the status outputs are often treated as a single, multi-bit register, which indicates all bits of output are logic zero. 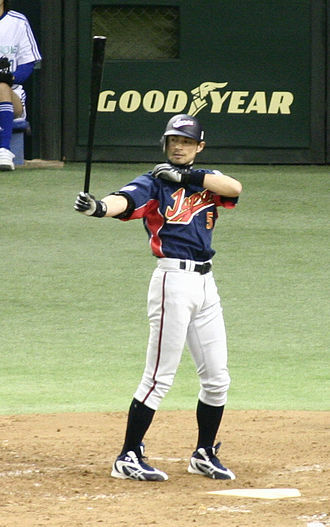 Negative, which indicates the result of an operation is negative. Overflow, which indicates the result of an operation has exceeded the numeric range of output. Parity, which indicates whether an even or odd number of bits in the output are logic one, the status input allows additional information to be made available to the ALU when performing an operation. 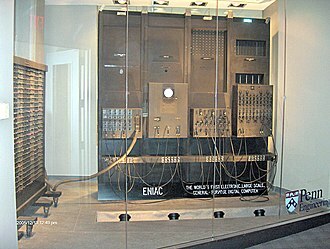 ENIAC was amongst the earliest electronic general-purpose computers made. It was Turing-complete and could solve a large class of problems through reprogramming. ENIAC was formally dedicated at the University of Pennsylvania on February 15,1946 and was heralded as a Giant Brain by the press. This combination of speed and programmability allowed for thousands more calculations for problems, ENIACs design and construction was financed by the United States Army, Ordnance Corps and Development Command, led by Major General Gladeon M. Barnes. The total cost was about $487,000, equivalent to $6,740,000 in 2016, ENIAC was designed by John Mauchly and J. Presper Eckert of the University of Pennsylvania, U. S. The team of design engineers assisting the development included Robert F. Shaw, Jeffrey Chuan Chu, Thomas Kite Sharpless, Frank Mural, Arthur Burks, Harry Huskey, in 1946, the researchers resigned from the University of Pennsylvania and formed the Eckert-Mauchly Computer Corporation. ENIAC was a computer, composed of individual panels to perform different functions. Twenty of these modules were accumulators which could not only add and subtract, numbers were passed between these units across several general-purpose buses. In order to achieve its high speed, the panels had to send and receive numbers, save the answer and trigger the next operation, all without any moving parts. Key to its versatility was the ability to branch, it could trigger different operations, depending on the sign of a computed result. By the end of its operation in 1955, ENIAC contained 17,468 vacuum tubes,7200 crystal diodes,1500 relays,70,000 resistors,10,000 capacitors and approximately 5,000,000 hand-soldered joints. 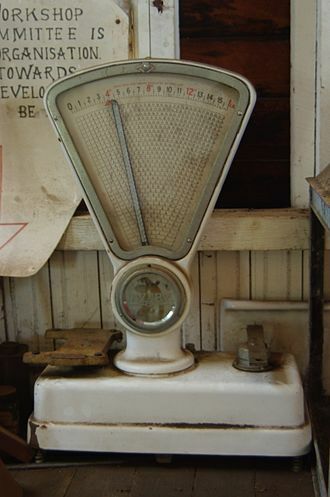 It weighed more than 30 short tons, was roughly 2.4 m ×0.9 m ×30 m in size, occupied 167 m2 and this power requirement led to the rumor that whenever the computer was switched on, lights in Philadelphia dimmed. Input was possible from an IBM card reader and an IBM card punch was used for output and these cards could be used to produce printed output offline using an IBM accounting machine, such as the IBM405. 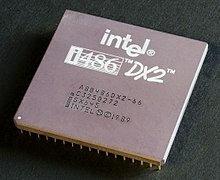 The Intel i486DX2, rumored as 80486DX2 is a CPU produced by Intel that was introduced in 1992. The i486DX2 was nearly identical to the i486DX, but it had additional clock multiplier circuitry and it was the first chip to use clock doubling, whereby the processor runs two internal logic clock cycles per external bus cycle. An i486 DX2 was thus faster than an i486 DX at the same bus speed thanks to the 8K on-chip cache shadowing the slower clocked external bus. For many players of games during the early and mid 1990s, towards the end of the MS-DOS gaming era. The introduction of 3D graphics spelled the end of the 486s reign, because of their use of floating point calculations. An i486DX2-50 version was available, but because the bus speed was 25 MHz rather than 33 MHz. There are two versions of the DX2 - Identified by P24 and P24D, the latter has a faster L1 cache mode, called write-back. 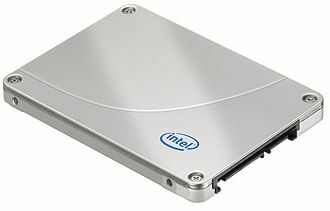 The original P24 version offered only the slower write-through cache mode, AMD and Cyrix both produced a competitor for the Intel i486DX2. 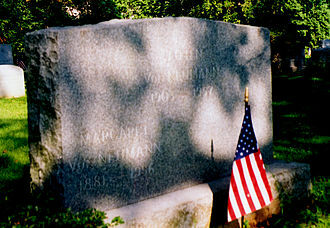 John von Neumann was a Hungarian-American mathematician, inventor, computer scientist, and polymath. He made major contributions to a number of fields, including mathematics, economics and statistics. He published over 150 papers in his life, about 60 in pure mathematics,20 in physics, and 60 in applied mathematics and his last work, an unfinished manuscript written while in the hospital, was published in book form as The Computer and the Brain. His analysis of the structure of self-replication preceded the discovery of the structure of DNA, also, my work on various forms of operator theory, Berlin 1930 and Princeton 1935–1939, on the ergodic theorem, Princeton, 1931–1932. During World War II he worked on the Manhattan Project, developing the mathematical models behind the lenses used in the implosion-type nuclear weapon. After the war, he served on the General Advisory Committee of the United States Atomic Energy Commission, along with theoretical physicist Edward Teller, mathematician Stanislaw Ulam, and others, he worked out key steps in the nuclear physics involved in thermonuclear reactions and the hydrogen bomb. Von Neumann was born Neumann János Lajos to a wealthy, Von Neumanns place of birth was Budapest in the Kingdom of Hungary which was part of the Austro-Hungarian Empire. 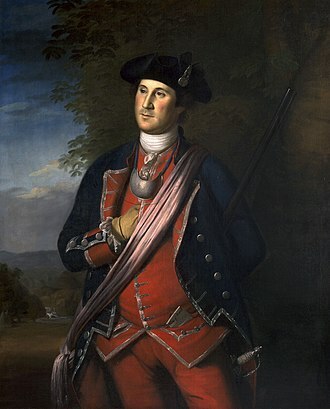 He was the eldest of three children and he had two younger brothers, born in 1907, and Nicholas, who was born in 1911. His father, Neumann Miksa was a banker, who held a doctorate in law and he had moved to Budapest from Pécs at the end of the 1880s. Miksas father and grandfather were both born in Ond, Zemplén County, northern Hungary, johns mother was Kann Margit, her parents were Jakab Kann and Katalin Meisels. Three generations of the Kann family lived in apartments above the Kann-Heller offices in Budapest. In 1913, his father was elevated to the nobility for his service to the Austro-Hungarian Empire by Emperor Franz Joseph, the Neumann family thus acquired the hereditary appellation Margittai, meaning of Marghita. The family had no connection with the town, the appellation was chosen in reference to Margaret, Neumann János became Margittai Neumann János, which he changed to the German Johann von Neumann. 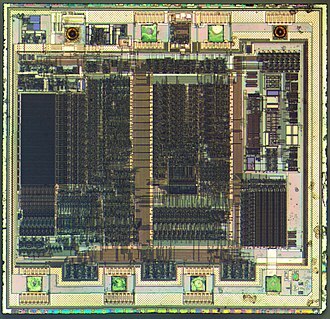 A system on a chip or system on chip is an integrated circuit that integrates all components of a computer or other electronic systems. It may contain digital, mixed-signal, and often radio-frequency functions—all on a single substrate, SoCs are very common in the mobile computing market because of their low power-consumption. 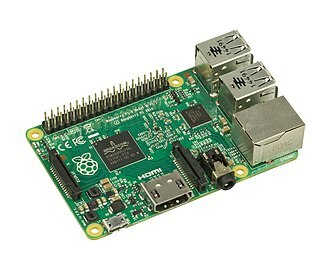 A typical application is in the area of embedded systems, the contrast with a microcontroller, SoC integrates microcontroller with advanced peripherals like graphics processing unit, Wi-Fi module, or coprocessor. As long as we remember that the SoC does not necessarily contain built-in memory, in general, we can distinguish three types of SoC. SoC built around a microcontroller, SoC built around a microprocessor, a separate category may be Programmable SoC, part of elements is not permanently defined and can be programmable in a manner analogous to the FPGA or CPLD. When it is not feasible to construct a SoC for a particular application, in large volumes, SoC is believed to be more cost-effective than SiP since it increases the yield of the fabrication and because its packaging is simpler. Another option, as seen for example in cell phones, is package on package stacking during board assembly. The SoC includes processors and numerous digital peripherals, and comes in a ball grid package with lower and upper connections. The lower balls connect to the board and various peripherals, with the balls in a ring holding the memory buses used to access NAND flash. Memory packages could come from multiple vendors, DMA controllers route data directly between external interfaces and memory, bypassing the processor core and thereby increasing the data throughput of the SoC. A SoC consists of both the hardware, described above, and the controlling the microcontroller, microprocessor or DSP cores, peripherals. 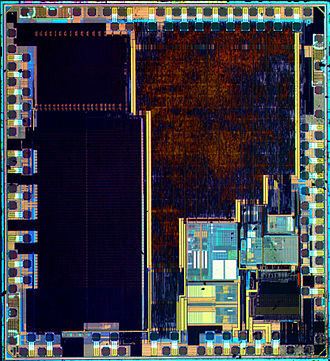 The design flow for a SoC aims to develop hardware and software in parallel. Most SoCs are developed from pre-qualified hardware blocks for the elements described above. Of particular importance are the protocol stacks that drive industry-standard interfaces like USB, the hardware blocks are put together using CAD tools, the software modules are integrated using a software-development environment. The term originally referred to the large cabinets called main frames that housed the central processing unit and main memory of early computers. Later, the term was used to distinguish high-end commercial machines from less powerful units, most large-scale computer system architectures were established in the 1960s, but continue to evolve. Their high stability and reliability enable these machines to run uninterrupted for decades, Mainframes are defined by high availability, one of the main reasons for their longevity, since they are typically used in applications where downtime would be costly or catastrophic. 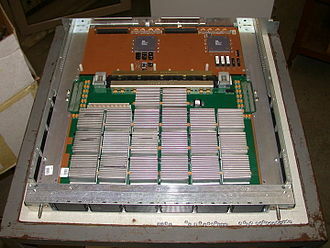 The term reliability and serviceability is a characteristic of mainframe computers. Proper planning and implementation is required to exploit these features, and if improperly implemented, in the late 1950s, most mainframes had no explicitly interactive interface, but only accepted sets of punched cards, paper tape, or magnetic tape to transfer data and programs. In cases where interactive terminals were supported, these were used almost exclusively for applications rather than program development and Teletype devices were common control consoles for system operators through the 1970s, although ultimately supplanted by keyboard/display devices. 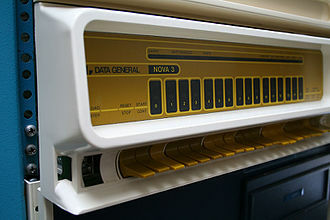 By the early 1970s, many mainframes acquired interactive user interfaces and operated as timesharing computers, users gained access through specialized terminals or, from personal computers equipped with terminal emulation software. By the 1980s, many mainframes supported graphical terminals, and terminal emulation and this format of end-user computing reached mainstream obsolescence in the 1990s due to the advent of personal computers provided with GUIs. After 2000, most modern mainframes have partially or entirely phased out classic green screen terminal access for end-users in favour of Web-style user interfaces, the infrastructure requirements were drastically reduced during the mid-1990s, when CMOS mainframe designs replaced the older bipolar technology. IBM claimed that its newer mainframes could reduce data center energy costs for power and cooling, modern mainframes can run multiple different instances of operating systems at the same time. This technique of virtual machines allows applications to run as if they were on physically distinct computers, in this role, a single mainframe can replace higher-functioning hardware services available to conventional servers. While mainframes pioneered this capability, virtualization is now available on most families of computer systems, Mainframes can add or hot swap system capacity without disrupting system function, with specificity and granularity to a level of sophistication not usually available with most server solutions. Modern mainframes, notably the IBM zSeries, System z9 and System z10 servers, such a two-mainframe installation can support continuous business service, avoiding both planned and unplanned outages. In practice many customers use multiple mainframes linked either by Parallel Sysplex and shared DASD, or with shared, Mainframes are designed to handle very high volume input and output and emphasize throughput computing. Since the late-1950s, mainframe designs have included subsidiary hardware which manage the I/O devices and it is common in mainframe shops to deal with massive databases and files. Gigabyte to terabyte-size record files are not unusual, compared to a typical PC, mainframes commonly have hundreds to thousands of times as much data storage online, and can access it reasonably quickly. In mathematics and mathematical logic, Boolean algebra is the branch of algebra in which the values of the variables are the truth values true and false, usually denoted 1 and 0 respectively. It is thus a formalism for describing logical relations in the way that ordinary algebra describes numeric relations. 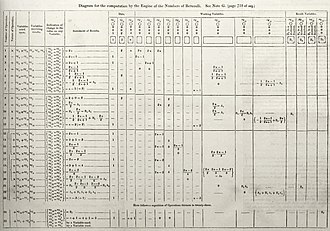 Boolean algebra was introduced by George Boole in his first book The Mathematical Analysis of Logic, according to Huntington, the term Boolean algebra was first suggested by Sheffer in 1913. Boolean algebra has been fundamental in the development of digital electronics and it is used in set theory and statistics. 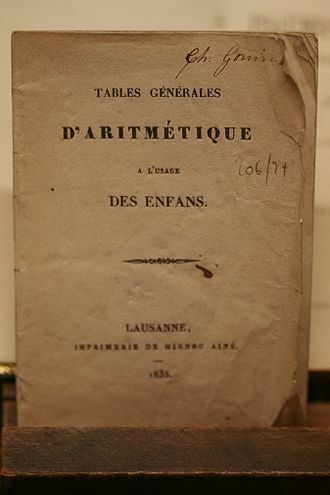 Booles algebra predated the modern developments in algebra and mathematical logic. In an abstract setting, Boolean algebra was perfected in the late 19th century by Jevons, Schröder, Huntington, in fact, M. H. Stone proved in 1936 that every Boolean algebra is isomorphic to a field of sets. Shannon already had at his disposal the abstract mathematical apparatus, thus he cast his switching algebra as the two-element Boolean algebra, in circuit engineering settings today, there is little need to consider other Boolean algebras, thus switching algebra and Boolean algebra are often used interchangeably. Efficient implementation of Boolean functions is a problem in the design of combinational logic circuits. Logic sentences that can be expressed in classical propositional calculus have an equivalent expression in Boolean algebra, Boolean logic is sometimes used to denote propositional calculus performed in this way. Boolean algebra is not sufficient to capture logic formulas using quantifiers, the closely related model of computation known as a Boolean circuit relates time complexity to circuit complexity. Whereas in elementary algebra expressions denote mainly numbers, in Boolean algebra they denote the truth values false and these values are represented with the bits, namely 0 and 1. Addition and multiplication play the Boolean roles of XOR and AND respectively, Boolean algebra deals with functions which have their values in the set. 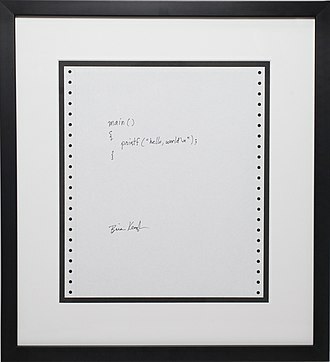 A sequence of bits is a commonly used such function, another common example is the subsets of a set E, to a subset F of E is associated the indicator function that takes the value 1 on F and 0 outside F.
A paper tape, constructed from punched cards, in use in a Jacquard loom. The large holes on each edge are sprocket holes, used to pull the paper tape through the loom. The Manchester Mark 1 was one of the world's first stored-program computers. Title page the First Draft, copy belonging to Samuel N. Alexander, who developed the SEAC computer based on the report.